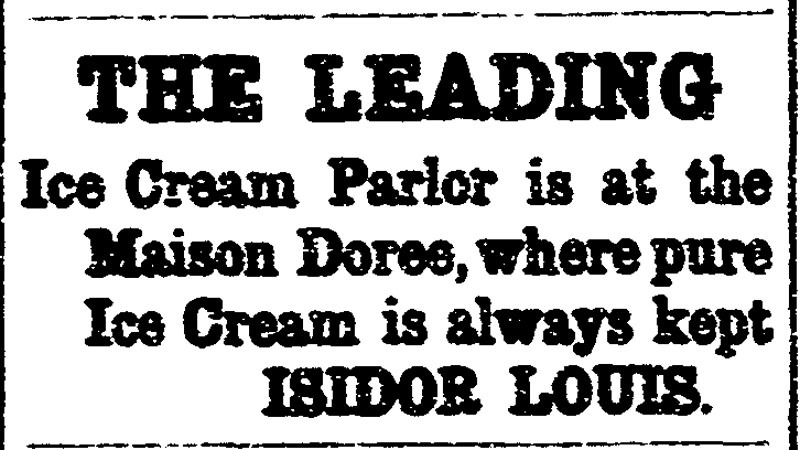 You can find a lot of ads about the Maison Doree in San Diego papers of the period, including references to its ice cream being made “from pure cream.” Maison Doree was also a general restaurant as well as a store and a place that could be rented out for group events. I sought more background on Isidor Louis and found him in the 1880 United States Census living in San Diego but with the occupation of shoemaker. I wasn’t sure if this was the same guy until I discovered that he was indeed the same person, a Jewish immigrant from Poland who’d come to San Diego in 1870, by way of San Francisco and Los Angeles and a return trip to Poland to marry in the interim. He had indeed been a maker of boots and shoes. He continued to do that but also had an eye for other opportunities. Seeing the need for ice in the warm summer months, he set himself up as an ice merchant, getting ice cut from Lake Tahoe in the winter and shipping it to an insulated warehouse in San Diego where he sold it to consumers seeking to cool their beer and liquor and preserve their food. In the late nineteenth century Louis also built an opera house, now demolished, and a bank building, the Louis Bank of Commerce which still stands today. Isidor Louis died in Los Angeles in 1896, but he is commemorated today as a pioneering San Diego entrepreneur and philanthropist, with a very cool legacy, literally and figuratively. Sources for this post included The Journal of San Diego History, historic San Diego newspapers, the U. S. National Archives, and the Jewish Museum of the American West.